Mobile phone sends and receives 2-3 GHz signals which are in the Microwave range. In most Phones, it is in the 2.5 GHz range. This signal helps for long range communication without any disturbance. During active state, the RF radiation from the Mobile phone is very high and Mobile phone emits strong bursts of RF energy. This sweeps around us as pulsating energy. An ordinary RF detector cannot detect the Mobile phone radiation because it is in the Giga Hertz range. This circuit detects the RF energy from an active Mobile phone. To capture the RF energy from the Mobile phone, a Diode – Capacitor combination is used along with the Antenna. Diodes IN60 capture the RF energy from the active phone and capacitor C1 stores this energy. IN 60 is the Germanium Signal Diode that also rectifies the RF to feed into the Op Amp. You can use any Signal diode like IN 34, OA 71, OA 91 etc. It is important to note that, only CA3130 will work in this circuit, because it requires very low input voltage and current for activation. You will not get result in other Op Amps like CA 3140, LM 714 etc. So when the RF signals enter into the Inverting input of IC1 through R1, It amplifies the signals. Its gain is determined by the input resistor R1 and the Feedback resistor R2. So when the IC1 triggers, it gives high output. Since the RF from Mobile phone is pulsating, output from IC1 will also be pulsating. This voltage is around 1 volt, when the phone is around 1 meter away. But when the phone is very close, the output voltage from IC1 will be around 3V. The high output from IC1 triggers T1 and it conducts. At this time, the Red transparent LED blinks. Its brightness depends on the distance between the circuit and the active Mobile phone. That is, LED blinks brightly when the phone is very close. This LED indication is not sufficient to get the indication. So a Monostable timer using IC NE 555 is used to get a short duration beep once the Circuit gets the first signal from the Mobile phone. IC2 is designed as a short duration timer of 3 seconds using the resistor R7 and capacitor C3. The trigger input (Pin2) of the Monostable is tied to the Collector of T1.So when T1 conducts by receiving the high output from IC1, its collector voltage drops and the Trigger pin of the Monostable will be grounded. This triggers the Monostable and its output turns high for 3 seconds. This gives a short beep from the Buzzer. The beep continues till the Mobile phone stops its activity. Two LED indications are provided. The Green LED indicates Standby state. When the output of IC2 remains low, it sinks current. The Cathode of Green LED is connected to the output of IC1. So it gets current path to the IC2 and lights. When the output of IC2 turns high, Red LED lights because IC2 is sourcing current. This indicates that the Mobile scanner detected an active Mobile phone. Assemble the circuit as compact as possible on a Perf board. Use a small metal wire or plastic wire as Antenna. You can also use a Telescopic antenna used in Pocket radios so that, its height can be adjusted. You can also use a Mini 12 volt battery used in Car remote to make the unit more compact. 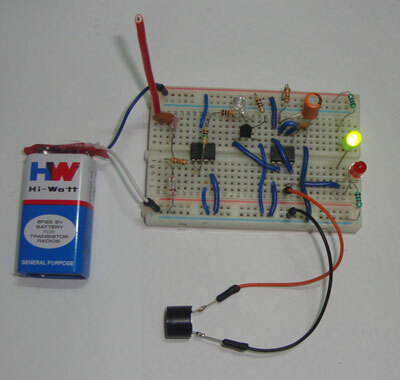 Add a switch between the Positive of battery and the circuit.